A cinder block one-story building barely sets Roberta’s Pizza apart from the surrounding industrial landscape in the Bushwick section of Brooklyn. However, inside a fire roars in the wood-fired oven and five white-coated chefs slide pizzas in and out of the oven creating a warming and inviting environment. Wood paneling and casual decor encloses a bustling dining area. There are a few private tables, but most diners are grouped together at several large picnic tables. Two modest sized bars, one in the back and one outside boast a limited but good mix of the usual bar options with a few creative twists thrown in. An hour and a half wait for a two top table gave us some time to explore some of the more interesting aspects that set Roberta’s apart from your average pizza joint and makes it an epicenter of local food and culture in Brooklyn. A quarter acre side lot houses Roberta’s kitchen garden, an outdoor oven, and gathering space. Melissa, Roberta’s farmer, manages the restaurant’s hyper-local food production. Portable container gardens, moved around with pallet jacks, are filled with a variety of herbs, greens, fig and apple trees, carrots, and a wild garden of borage whose cucumber essence flowers appeared later on our dessert. Seedlings are grown and tools are stored in a greenhouse constructed of a patchwork of repurposed windows. After visiting the restaurant, Alice Waters, seasonal chef and children’s garden advocate, funded the construction of a hoophouse, which perches atop two shipping containers. The simple greenhouses extend the season for salad greens in the spring and fall and humid loving tomatoes and eggplants in the summer. An intelligent use of vertical space, the shipping containers house Heritage Radio Network, an independent radio station that broadcasts more than 21 shows that focus on an in-depth look at the food system. 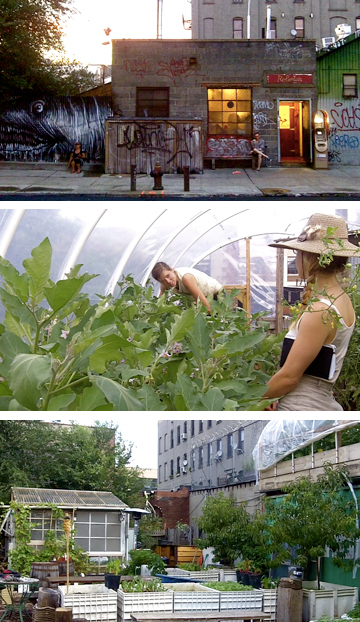 The owners of Roberta’s Pizza have been a prominent voice in the urban farm movement. In addition to their own garden, they also source many ingredients from farmers markets and small specialty growers in the area. Roberta’s co-owners, Brandon Hoy and Chris Parachini, helped found The Grange, a rooftop farm in Long Island City, Queens and currently sit on the board of directors. The Grange has a Sunday farm stand at the restaurant. Amidst the garden, self-identified “deep film nerd,” Gabe Soria, hosts a weekly outdoor movie night. The night we popped in the curatorial theme was “twisted rock musicals,” with a double header of Phantom of the Paradise and Purple Rain. Folks gather in tiki torch-lit, theater style seating to munch on $8 personal pizzas and imbibe cool summer drinks. Thursday night films plan to continue into the fall and winter so check Roberta’s website for future screenings. Eventually we are seated at a rough-hewn wooden table and benches, and get a chance to peruse the menu which is subdivided into four categories: Salumi, Market/Garden, Pizza, and Kitchen. In order to experience the whole gamut, we decide to get a dish from each category. A plate full of yellow and orange carrots arrived glistening in the dim light with smoked ricotta and garnished with one of my favorite mustard greens, “ruby streaks.” However, we had a hard time identifying the promised amaranth and our server unable to answer our question, kindly hurried off to the kitchen to find out from the chefs and returned with an answer that still left us wondering if we had actually eaten amaranth. Big fans of traditional foods, we were excited to taste sweetbread, a specially prepared gland. We were surprised when it came out breaded and fried and indulged happily in this contemporary take on comfort food but were wondering if the preparation negated the organ’s nutritious benefits. The Banana Hammock Pizza (béchamel, mozzarella, parmigiano, pork sausage, banana pepper, garlic, onion, cilantro on a thin crust) was a delicious combination of toppings and the hint of charred crust provided that authentic wood fired flavor. Always on the lookout for low sugar and gluten free desserts, the Avocado Semifreddo was especially intriguing. Of course, the tropical avocado and coconut swayed from the local theme, but the flavor was divine, the textures perfect in their contrast, and the borage flower garnish unified the pre-dinner, self-guided tour of the garden and the sensory satisfaction of a full belly and happy mouth. Attentive staff that functions as a team with at least four servers dipping in to take orders and clear dishes kept the experience flowing. If you want to avoid the crowds, Roberta’s also has a delivery business, but the value-added experience of movie night in the kitchen garden really puts the “culture” back in agriculture in Brooklyn’s own very unique way (Sara Worden & Susan Hilvert, 9/6/11).